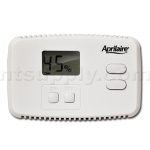 Aprilaire #76 control is for use with any dehumidifier requiring a normally open control, including Aprilaire Models 1710A, 1730A, 1750A, 1770A. NOTE: This is a 24Volt Control - and requires power from external 24V Transformer. Connect the wires from the C and R terminals on the Model 76 to the HVAC or thermostat C and R terminals for power. Approximately 5 feet off the floor (refer to local codes for compliance with the Americans with Disabilities Act). On an interior wall where the humidity is representative of the home being dehumidified. At least 18 inches away from an outside wall. Behind doors, in corners or other dead air spaces. In direct sunlight, near lamps or other sources of heat. On an outside wall or any wall exposed to an unconditioned space (i.e. garage). In the airflow path of a supply register or near outside doors. On a wall where concealed pipes or ductwork will affect the control temperature and relative humidity accuracy.